The hammer falls this Halloween! 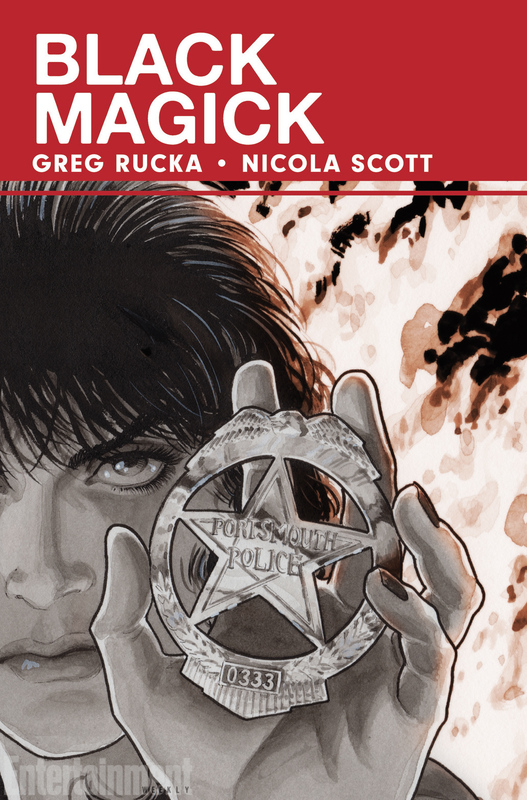 From New York Times bestselling and Eisner Award-winning writer GREG RUCKA (LAZARUS, Stumptown, Gotham Central) and superstar artist NICOLA SCOTT (Birds of Prey, Secret Six, Earth 2)! Detective Rowan Black works robbery/homicide for the Portsmouth PD, but her greatest mystery is the truth about herself…both who she has been, and who she will become. Yet there are others in Rowan’s world with very long memories, and the power that one person holds, another will always covet. PLUS, each issue also features an all-new work of original fiction by GREG RUCKA! A new gothic-noir ongoing series about legacy, destiny, redemption…and the price of magic. During the time of the Fall Equinox, powers are gathered, circles consecrated, and rituals performed. Pacts with ancient forces are made… and cell phones need to be answered. The life of a practicing witch is a complicated one, and Detective Rowan Black makes it even more so. From a circle of power in the middle of the woods, we jump to a hostage crisis in a burger joint. Before you start cracking wise, no Rowan doesn’t hop on a broom and fly to the crime scene with her robes flapping in the breeze. She changes into bike leathers and fires up her BMW motorcycle. In damn near perfect fashion, Black Magick blends two worlds… We have Rowan Black, Wiccan and wielder of arts both ancient and secret. We also have Detective Rowan (“Ro” to her friends) Black, police officer and rider of German made motor bikes. The dichotomy is a great one, and if you were to ask me a few years ago, I would have thought it was one that would be pretty tough to pull off without a hefty helping of cheese. Then I picked up a book by Jim Butcher about a wizard/private investigator working out of Chicago… but that’s a plug for a totally different book series (and a recommendation I wholeheartedly give, by the way). While Black Magick doesn’t quite have quite the same flavor of “urban fantasy” as Butcher’s Dresden Files, it does perform the same level of wizardry in the handling of the characters and their outside the norm situations. Greg Rucka, comic book writer and author of best-selling books, takes the concept of the “urban fantasy”, and grounds it in reality. Sure, his story starts out with a magic circle and a ritual, but we really don’t have any idea if it was essentially more than a Wiccan prayer meeting. If it was, I would have to say that this was still a pretty tightly written story, in a world populated by some pretty interesting characters. While Rowan Black doesn’t save the day with a wave of a wand and a well-placed fireball, she isn’t exactly limited to her police issue sidearm either. By the end of the first issue, the reader is introduced to a proposed reality that might not be as flashy and wizardly as we’ve seen in other stories, but still manages to get the job done. And here is where Nicola Scott’s artistic style knocks it out of the park (warning: slight spoiler ahead, me hearties). Where the book is mostly, and beautifully, done in black and white, we’re treated to some spectacular color work, compliments of digital colorist Chiara Arena, when Rowan finally lets her magic out of the box. When these two artists let their powers combine in a burst of color that comes after 25 pages done in shades of gray is, magic happens. Stylistically, the color lets the reader see that there’s something “special” happening, something beyond what the book has shown us so far. Thematically, I wondered if the singular use of color in a black and white book isn’t a glimpse into Rowan’s world… Spending so much time trying to fit her world of real magic into the perceptions of the mundane and unaware, are these brief splashes how she sees the world around her? Some might be interested to know that when he presented his story for publication, Rucka approached Jeanine Schaefer to work with as an editor. Her bio says that she’s worked for both DC and Marvel, which are fine professional qualifications. Furthermore, in a “letter from the editor” at the end of the book, she explains that part of her interest in working on this particular book had a more personal motivation. She is a practicing Wiccan , although by her own admission not as active one as she’d like to be. Regardless of Ms. Schaefer’s current religious standing, what I take away from her participation in Black Magic is a desire on the part of the creative team as a whole to “get it right”. While it would be interesting to find out from anyone who knows more about Wicca than I do if they succeeded, I can say that what has been put out is a very interesting and entertaining book, set in a very interesting world. Rowan Black might not be in the same league as the likes of Gandolf or Harry Dresden, but she’s no pushover either.